Tucked away between Raviwar and Shukrawar Peth, Bohri Ali is one of the oldest market-neighbourhoods in the city (active since the 1800s). Since we're fans of stationery, we decided to go hunting for some at Bohri Ali - and here's what we found. 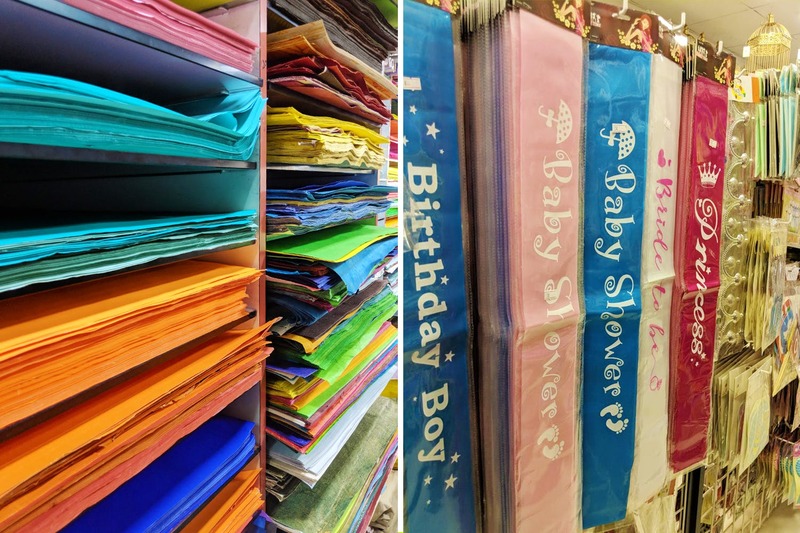 King's Paper Mart has cute, themed wrapping paper starting at INR 100 (10 sheets), while plain coloured chart paper is priced from INR 70/sheet. They can also make you a customised felt pin-board, a blackboard or white-board - starting at INR 100/sq foot. Lucky Paper Mart (opposite King's) stocks all kinds of ribbons in satin, plastic, and a multitude of colours. Satin ribbon reels are priced at INR 80 (for 10 thin, or 5 thick ribbons), and plastic ribbons for INR 100 (pack of 5). Abbas Hardware and Paints is a tiny shop that stands out for their stacks of brightly coloured chalk and rangoli powder (from INR 10/kg). Their shelves are lined with bottles of enamel paint (from INR 25 onwards), glass paints (INR 75 onwards), loose glitter, and buckets of paintbrushes in all sizes. Hatimi Papers is your one-stop-shop for all your party-planning needs. We found cute camera props from INR 70, photo-booth kits from INR 100, as well as glow-in-the-dark wristlets, paper straw packs, party napkins, baskets, props for bridal/baby showers, birthdays, and more. Also at Hatimi Papers, we liked their decorative paper boxes (INR 12 onward), patterned tins (starting at INR 55), and paper gift bags - priced from INR 100 (small) to INR 350 (big) in sets of 10. Gift tags and envelopes designed for every occasion are also available.